Over 2,000 years ago, the Syrian King whose name was Antiochus ruled in the country known today as Israel. He intended to force all the Jewish people who lived there to worship the Greek gods. The Jews didn’t want to do this and rebelled under the leadership of Judah Maccabee and his brothers. Their rebellion lasted for 3 years, and eventually, the Jews managed to drive the Syrians away from the country. When the rebellion was ended, the Jews started eliminating all Greek symbols from the temple of Jerusalem. They finished doing this on the 25th day of the month of Kislev. Afterwards, they decided to put the eternal flame there. However, they had a very small amount of oil that was enough to last only for a day. But the Jews decided to light it anyway and, according to the legend, they were surprised to see that it lasted for eight days! As a commemoration of these events, people celebrate Hanukkah today. The celebration lasts for eight days. People light candles on a menorah, also known as a Hanukiyah, which has nine spaces for candles. One of them is called Shamash. It is the first to be lit, and all other candles are lit from it. A next candle has to be lit on every night of celebration. Since the Jewish calendar is based on moon cycles, Hanukkah, as well as other Jewish holidays, falls onto different dates every year. Sometimes it begins on December 25, just like Christmas. 1. If you have Jewish friends, ask whether you can celebrate with them. It will be a very interesting and engaging way to learn their cultural traditions. 2. Get a menorah in a ceramic store and light the candles on it in accordance with the tradition. 3. Cook a traditional meal for Hanukkah, which is latkes – potato pancakes served with applesauce and sour cream. 4. Use Hanukkah colors (white, silver and blue) to decorate your home. 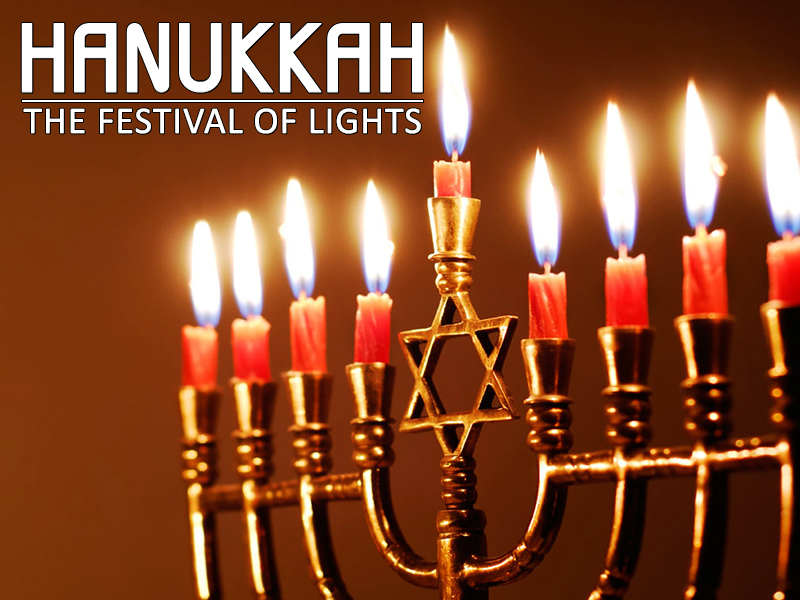 Try to celebrate Hanukkah this year to learn more about the Jewish culture and get the experience you’ve never had before.